Lenovo ThinkPad P50 20EN - Core i7 6820HQ / 2.7 GHz - Win 7 Pro 64-bit - 16 GB RAM - 512 GB SSD NVM Express (NVMe) - no ODD - 15.6" IPS 1920 x 1080 ( Full HD ) - Quadro M2000M / HD Graphics 530 - 802. 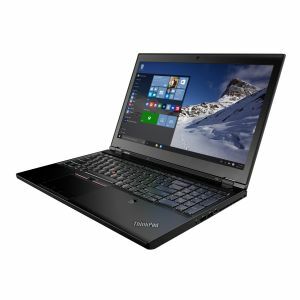 Lenovo's thinnest and lightest full-function mobile workstation yet, the ThinkPad P50 features a beautiful 15.6-inch UHD 4K display and is certified to run users' most requested ISV applications. The ThinkPad P50 is a feature-rich, highly powerful mobile workstation for performance-seeking users. As the follow-on to the ThinkPad W541, the P50 builds on the innovation and purposeful design of Lenovo's industry-leading ThinkPad mobile workstations.